The weekend before we left we were surrounded by our closest friends. On Saturday, we held the 4th annual installment of our summer boat party. The 35 ft., two-story pontoon boat comes complete with a bar, a slide, a bathroom and in our case 25+ people ready to enjoy a day on the lake. We partied our butts off and even shot off some fireworks. It’s a blast every single year. On Sunday we chilled with a few more of our good friends and finished the evening with a delicious Greek dinner with Athena’s bestie. Wednesday morning we packed up the last of our things and set off! 8 hours later we were in our first stop – Saint Louis. Neither of us had ever been there before so we didn’t know what to expect. We decided to couchsurf for the couple of days we were staying there and ended up with a really awesome couple Jon and Lala. They had a really great house with a cool walk through garden in the back. These guys were in what seemed to be in the later stages of a pretty large-scale home renovation project and were really doing some fantastic work to their place. They offered us tour own room with a queen bed which we were very thankful for. Although we haven’t surfed much, we have heard that a private room with a large bed can sometimes be harder to find. Jon and La la were really easy-going, accommodating, fun and just all around great. We couldn’t ask for better hosts. I think they really spoiled us for our first surfing experience. Wednesday evening we went to dinner at a place called Square One Brewery and Distillery per our hosts recommendation and it was absolutely delicious~ The beer was great and the food was even better! 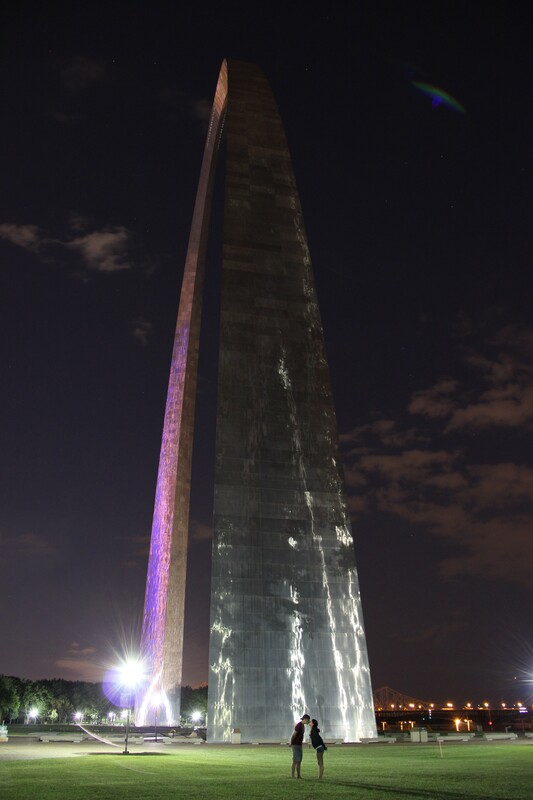 We walked around a local park and then went to see the Arch at night which was quite a site. For our last night our host cooked us a delicious fish dinner and then took us to a micro brewery where we were able to meet some our their friends and hang our for a while. We had a great time, their friends were very welcoming and outgoing. We thoroughly enjoyed meeting and hanging out with them and it was a great way to tie up our time in Saint Louis.